I don't believe there are intrinsically evil people. But based on the psychological research reported by Dr. Jonathan Haidt of NYU, I believe that certain people have a genetic disposition toward an extreme sensitivity to threats. This aberrational imbalance in some cases causes a drum beat of inner fear that leads to emotional atrophy . . . a complete loss of empathy toward others. According to research psychologist Dr. Nathan Brooks, this mal-adaptation leads to two principal outcomes: one is jail, and the other is becoming a CEO, politician, or lawyer. The psychological condition is called the Dark Triad. Yes, unfortunately the Dark Triad is a "thing." It is a psychological condition that has been studied extensively over the last 25 years because it is distinctively prevalent among males who attain powerful leadership positions in large organizations and institutions. A narcissist is characterized by an inner voice that is self-inflated, entitled, insecure, and focuses outer behavior on extreme status seeking. Narcissists are also superficially charming. A psychopath is selfish, egotistical, dishonest, and cruel. A manipulator is deceitful, ruthless, and exploitative. A common characteristic of a member of the Dark Triad is negative empathy. This is a way of reading others peoples' needs, interests, and vulnerabilities in a way to take advantage of them. It won't surprise you that although psychologists estimate that only 1% of the population fall in the Dark Triad category, they make 30% of the prison population. What will surprise you is in a study reported in the Frontiers of Neuroscience in 2014, a series of validated assessments was administered to hundreds of random CEOs, and 20% were classified as leaders with the psychological characteristics of the Dark Triad. That's right, it's 20 times more likely to run into a Dark Triad CEO than a Dark Triad individual. It's quite simple. Business organizations are run like dictatorships. They are inherently authoritarian structures. Employees are given orders and are rewarded and punished on the basis of their achievement of goals and demands of senior leaders. Authoritarian organizations attract narcissistic personalities because they bestow status, power, and privilege on the few who make it to the top. Narcissists will do whatever it takes to satisfy their addiction to status. Large organizations also reward psychopaths with power because, as Dr. Jeffrey Pfeffer of Stanford University research confirms, dishonesty, exploitation, and self-aggrandizement lead to moving up the ladder of power far more often than virtues and morality. 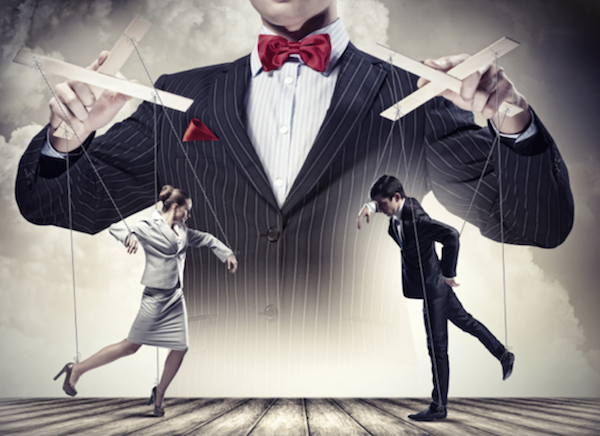 Manipulators also win more often in command-and-control-led organizations because, according to Pfeffer's research, half-truths, outright deception, and blaming are rewarded far more often than honesty, transparency, and authenticity. Pfeffer's research also points out that large organizations attract deviant, Dark Triad personalities because ruthless power plays are consistently rewarded. And according to Dark Triad expert Dr. Nathan Brooks, the same characteristics that enable members of the Dark Triad to enter into the highest levels of business leadership are also true for our political institutions and the profession of law. I have a solution to all this toxic leadership, and you probably know what it is. Men are 20 times more likely to have Dark Triad personality traits than women. That's because women are generally far more interested in group success than individual status. In fact, women assess threats in the context of the group they belong to rather than as individuals. Women try to diffuse threats through mutual understanding and reciprocal benefits rather than dominance and conflict. Please understand I am not saying that all male leaders are dark manipulators. I have worked with many high-level male executives and CEOs who went to work every day as servant leaders. And yet, what I have found is that the pressure from board members and analysts, who are solely focused on creating stockholder wealth, tends to wear down the higher motives of even the best men. The reason for this pressure is the same. Authoritarian structures magnify the self-interests of the few at the top. That pressure is corrupting. First, authoritarian organizations typically reward the wrong people with power. We may not be able to completely eliminate organizational structure because structure is necessary for large organizations. But we can transform cultural standards, beliefs, and behaviors, and we can institute work processes, policies, and practices that increase group intelligence and true value creation for all stakeholders. Second, I am now convinced the only way to achieve the first goal is to elevate far more women who exhibit collaborative values and skills (rather than women who mimic men) to the role of CEO and Chairwoman of the Board. That's why I am founding the SMART Women Institute with National University and partnering with WITI (Women in Technology International). Our mission is to train one million women in five years in the science-based skills of SMART Power. These skills bring to life the mindset of Transformational Leadership, written about by the renowned leadership historian, James McGregor Burns. This is not just a leadership theory. It is a disciplined practice that we intend to equip a million women, and the many men who support them, with the leadership vision and skill to create a future we want our children to inherit. To get more information about how you can become part of this movement, please contact us at [email protected]. We will send you our mission-strategy overview, a list of events, and how you can get involved.